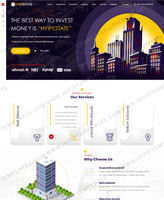 IHYIP Templates is a highly reputed HYIP services providing company which is established to provide small and large-scale businesses with design and development services. We solely work online, that is, via the World Wide Web. When you place an order to our company, we will assign with a team of highly creative and experienced designers who will handle your order efficiently and complete it in a timely manner. Rest assured, we will provide with a highly creative and compelling logo, website, banner, domain name & hosting services, SEO services for your business. You must supply all materials and information required by us to complete the work in accordance with any agreed specification. Such materials may include, but are not limited to, photographs, written copy, logos and other printed material. Where there is any delay in supplying these materials to us which leads to a delay in the completion of work, we reserve the sole right to extend any previously agreed deadlines by a reasonable amount. Where you fail to supply materials, and that prevents the progress of the work, we have the right to stop work and invoice you for any balance on the contract. All website designed by us are search engine friendly. However we do not guarantee any specific position in search engine results for your website. We perform search engine optimization according to current best practice at an additional cost. We will supply to you account credentials for domain name registration and/or web hosting that we purchased on your behalf. Upon agreements, any further alterations, additions, or detailed consultations regarding the project by the client may result in additional charges. 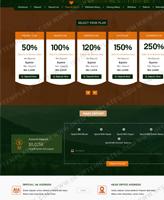 IHYIP Templates has a Privacy Statement disclosing what information we collect about visitors, how we use such information and the steps we take to secure such information. Click Here to view the Privacy Statement. 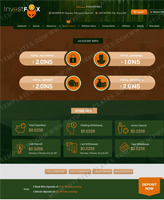 The customer support center of IHYIP Templates is always available at the disposal of the client round the clock, that is, 24 hours and 7 days a week. With such kind of round the clock customer support you are assured to get the attention that you deserve. For your convenience we offer numerous communication channels: EMAIL and LIVE CHAT. We provide an extensive portfolio for you to view before buy services for your project so you can see the quality level of our work and be completely comfortable working with us. Cancellation of the project at the request of the Client must be made in writing. In the event cancellation is requested, we shall have the right to retain all payments to date, and any invoiced amounts will be deemed payable on the contract. 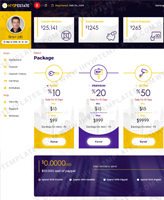 In the event this amount is not sufficient to cover the Development time and expense already invested in the project, additional payment will be due for the hours incurred from client. 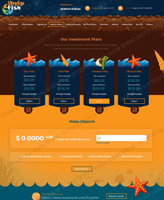 Payments for custom design projects are made to us in increments as a courtesy to the client. Once a payment or deposit is made, it is non-refundable. 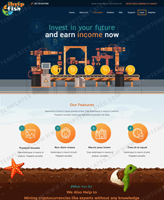 If a project is cancelled or postponed, all money paid are retained by IHYIP Templates and if applicable, a fee for all work completed beyond what was already paid for shall be paid by the client. Payments for past months of web hosting are non-refundable. Hosting accounts are set up at the time of order and are allotted a specific amount of server resources, according to the plan purchased. 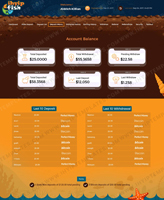 If client did not make use of the account, payment for services is still due. Hosting accounts are not cancelled until notice is received from the client, or until 5 days after due date of payment not received. If you have any questions, please contact us prior to making a payment for our services. Thank you!